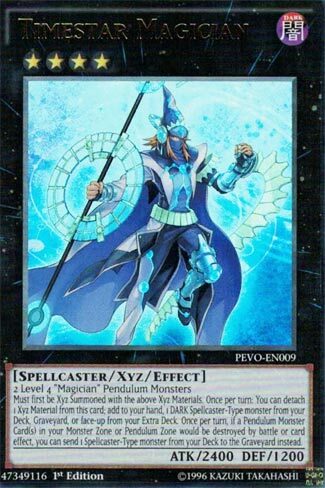 Timestar Magician is the archetypes Xyz monster, needing Pendulum monsters that are Level 4 to summon. This monster won’t be seeing any play in other decks other than the archetype. Searcher for a DARK Spellcaster, but can search anywhere but the banished zone. For one material to get a deck thin, a resource back from your Extra Deck or Graveyard, that is an easy trade. Searching the deck gives you another Pendulum for your zone or field. If to complete your scales you won’t need to search the Extra Deck for another Pendulum Monster. Protection and deck thin ability rolled into one for the second effect. The ability not to mill a card but rather search and choose the monster you send to the grave for protection gives you control of what you put in the grave and sets up future moves. The protection also covers multiple cards in the Pendulum Zones and on your field. This card can stop so many cards with minimal effort. You can protect your Pendulum card(s) once per turn, then get the monster you sent to the grave back the next turn with the first effect. Stats are good for a Rank 4, support behind it, and it maintains great field presence without Xyz Materials. It’s a shame this card isn’t flexible outside the archetype. That aside, it is a powerhouse for Pendulum Magicians. Timestar Magician is a Rank 4, everyone’s favorite, requiring 2 Level 4 Magician Pendulum Monsters, thankfully not generic, and must first be Xyz Summoned using those materials, but that doesn’t really matter because this is how you should be summoning this guy. Once per turn, you can detach an Xyz Material from this card to add a Dark Spellcaster from your deck to your hand. This obviously excels in the Pendulum Magician deck, as you can search for Skullcrobat Joker, Double Iris Magician, Astrograph Sorcerer, etc. All of those cards I mentioned are great for generating the plusses in the Pendulum Magician deck and are all staple as 3 ofs. Also, if a Pendulum Monster would be destroyed, either as a monster or in the scale, you can send from the deck to the GY a Spellcaster instead. This is meant to load the GY with the Pendulum Magicians you can use with Astrograph to summon Z-ARC, so this is great for that as well as protecting any card that is important to you, it especially synergizes well with the Pendulumgraph Trap. Possibly one of the best archetypal Xyz monsters I have seen, play 2 of this in the Pendulum Magician deck, it is that good. I would of said 3 if Extra Deck space wasn’t tight. Shifting from Pendulum cards to XYZ, we look at Timestar Magician. This is an XYZ who is Rank 4 with 2400 attack and 1200 defense, and XYZ Summoned with two Magician Pendulum Monsters. So first off, you can detach an XYZ Material (once per turn) to add a Dark Spellcaster from your Deck, Graveyard, or face-up Extra Deck to your Hand. Versatility is good, and this is wide open. Any Level, from anywhere, as long as it’s Dark. This card also adds welcome protection to your Deck, as if a Pendulum Monster you control (as a Monster or in the Pendulum Zone) would be destroyed, you can send a Spellcaster (note here ANY, not Dark) from your Deck to the Graveyard instead. Wow, this guy isn’t quite as amazing as the past two cards, but he’s good in his own regard. Protection is good, and the dump ability fuels this Deck also.